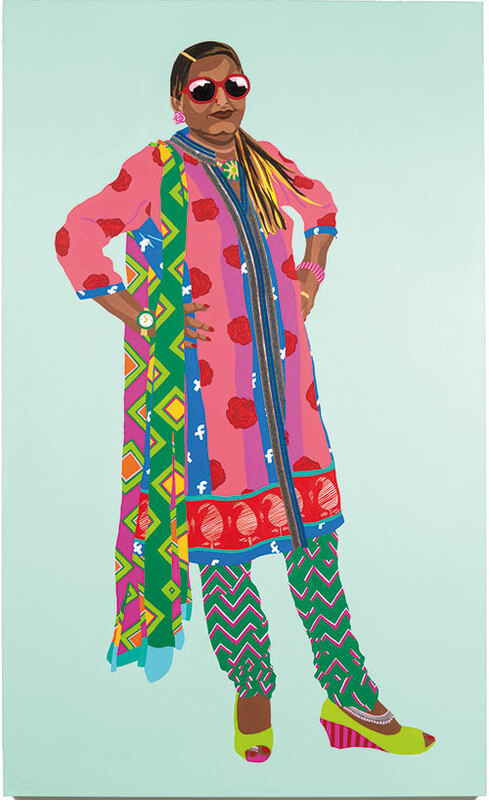 India-born and Canada-based Meera Sethi’s work has strong colourful and sartorial — often over-the-top — overtones. 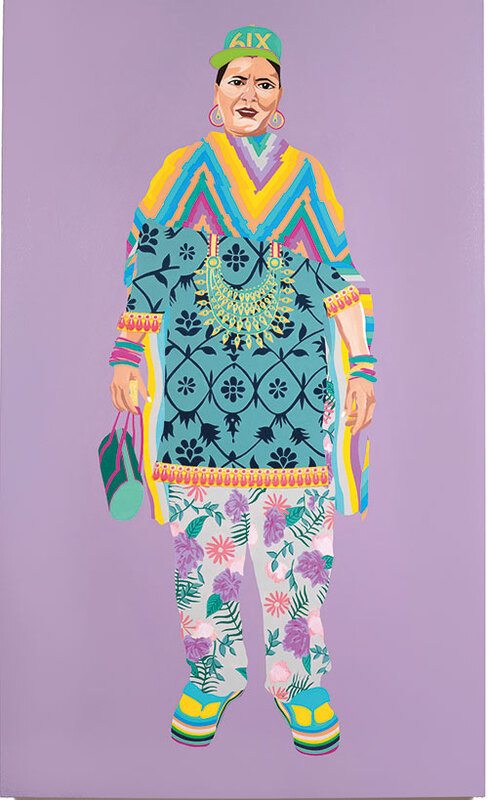 In her most recent series of mixed-media paintings, Begum, Sethi has explored diverse nuances of queer fashion. 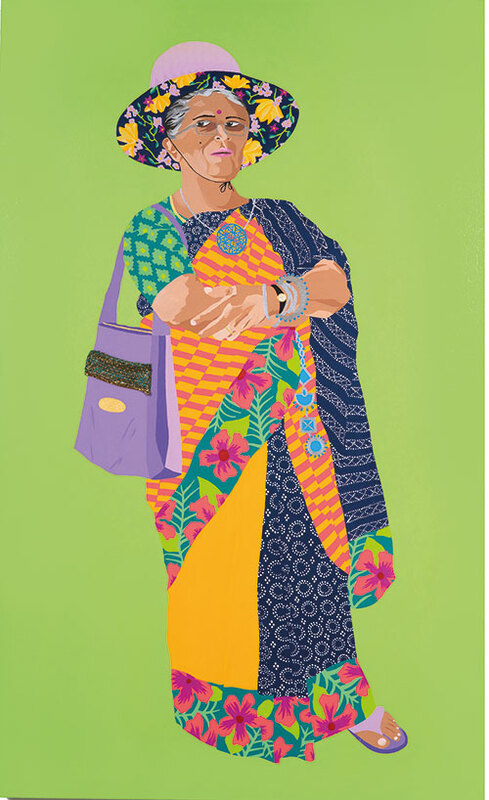 Upping The Aunty — a multidimensional project — put the aunties she has met, seen or heard of at the centre of the works, capturing them in different looks and styles. 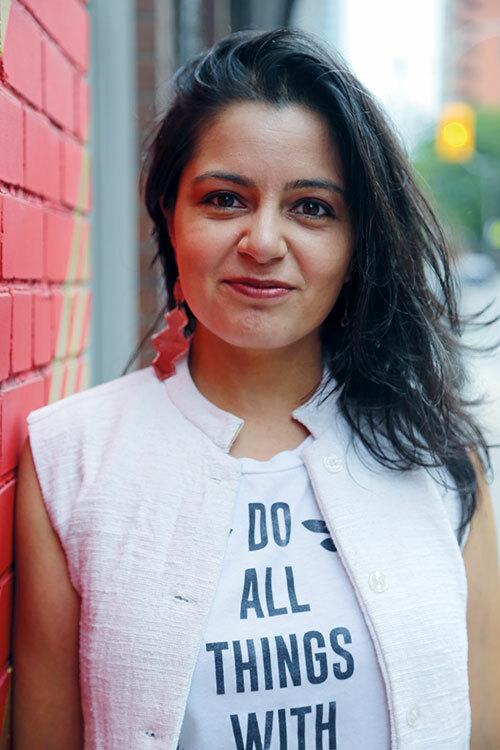 In fact, Ramvati Aunty — in the creation that bears the same name, and which has found a permanent place at the Royal Ontario Museum — has fresh flowers in her hair, a matching barrette, a South Indian-pierced wooden comb hung delicately across her neck under a golden mangalsutra, and sports an iconic reusable nylon shopping bag. What were the early inspirations that fuelled your creativity? As a child, I loved art class. I was also quite shy and introverted, so artmaking felt like a way in which I could express myself. You straddle two continents and are connected to both India and Canada. How do these countries find a place in your work? I do feel like I belong to both places; and since my work draws from my own life, both countries find their way into my practice. It’s not something I feel I have too much of a choice about — and I consciously use my art to integrate identities and experiences, so the two countries figure into that as well. Does the fact that you blend the east and the west give your creations a cutting- edge position? As a relative ‘outsider’ in both locations, I do feel that I occupy a peripheral position. This allows insights that would, perhaps, allude to someone who hasn’t had this breadth of experience. How do your journeys to India shape your work? I travel to India nearly every year. I have lots of family and some friends. But it’s hard to say how visits to India directly shape my work because I do not come here looking to be influenced or to find inspiration the way a tourist would. The act of being in a city or a country that in some ways is vastly different to my primary home (Canada) leads to experiences that can be jarring or unsettling. The general atmosphere or culture of a city like New Delhi with its sights, sounds, smells and climate leaves an impression that persists in the comparative quietness of Toronto. This leads to interesting juxtapositions that find their way into my work. Would you say the diaspora plays a big role in colouring your work? The idea of a ‘diaspora’, of a people who have come from somewhere else to disperse and settle somewhere else, is the primary foundation of my work. I don’t know anything other than diaspora. I have never ‘lived’ in India for more than a few months at a time. My knowing of India is as a diasporic subject. My knowing of Canada is also as a diasporic subject, where I cannot remove my South Asianness from my experience as a Canadian. My work seems to resonate most with people who have had significant experiences of living in two or more places. That ‘outsider’ or ‘third-space’ identity, as I call it, is a diasporic consciousness that is creative. There is a strong social comment in Begum. Do you feel that art that is used to make social comments has a greater appeal? It depends who you speak to. Art has so many functions. For some, artwork that is explicitly politicised (all art has a political component to it) is a bigger draw. I have always found that art that is most appealing to me is that which can impact my heart and mind at the same time. Does it make me ask questions? Does it make me a critical participant in life? That is the work that is most meaningful to me and the work I strive to create. Representing older women of colour is an important part of your work — especially in the series upping the aunty…. What inspires each ‘person’ you have painted? 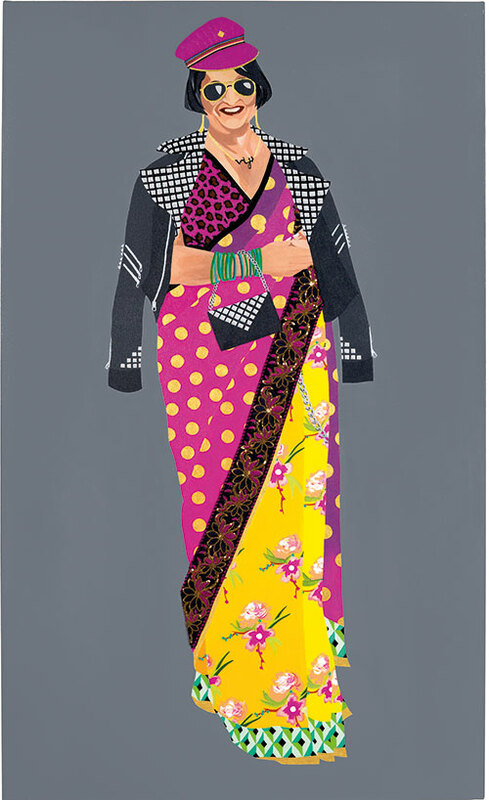 The Upping The Aunty series is inspired by my aunties and the culture of ‘aunty street style’. 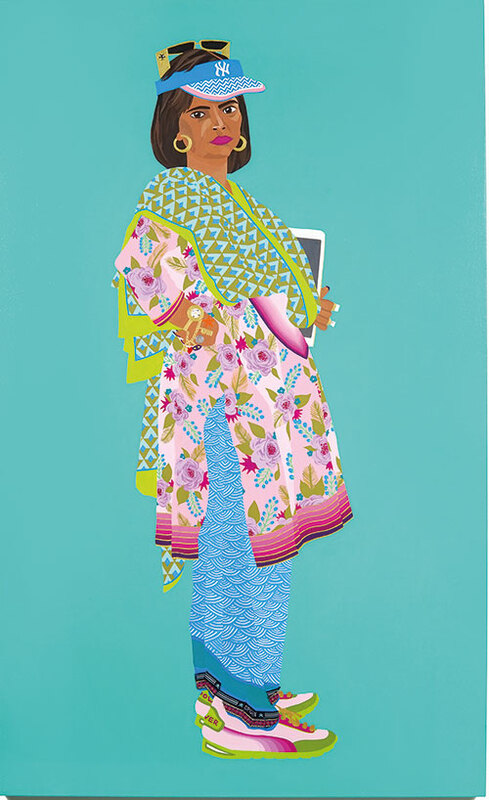 Each figurative painting in the series is inspired by an ‘aunty’ I have met and her sartorial choices. I work with my impression of who I have met and use that as the basis for the aesthetic decisions I make in the work. Ramvati Aunty is superfly. My work is largely inspired by the people around me. It’s not so much particular individuals, but rather, a sense of community. I look at clothing, fashion and dress in broad strokes, honing in on themes, trends and attitudes that help us identify communities. This is an intuitive way of looking. I often find that the first thing I notice about my environment is the clothing culture. Do you use the metaphor of fashion to explore the question of identity? Fashion and identity are inseparable. The way we put ourselves together ‘creates’ who we are in some ways. We are constantly performing a version of ourselves, and dress is a fascinating part of this performance — whether or not one is consciously responding to ‘fashion’, we all fashion ourselves in particular ways. Quite a few of your paintings have fashionable elements in them. How do you work out the overall ‘looks’? I like to combine fashion elements in unexpected ways. That is what is exciting to me. You see it on the streets and in people’s homes. The way someone, somewhere, began wearing socks with sandals then inspired socks with stilettos. This is not how these items were intended to be worn. I like to document and play with this, whether it is in a series that looks at outsiders, aunties or queers. What is your take on the ‘politics of dress’? There are many deeply important current political questions tied to the world of dressing. Some of these are urgent and critical — for example, working conditions in sweatshops and export processing zones; fast fashion and environmental waste; the toxic chemical processes that line our clothes and poison those who make them; and the loss of traditional and ancient craft and cloth-making practices. Clothing is about so much more than identity. It has a very real impact on everyday lives and the future of our planet. Of the many mediums that you work in, is there any one that is your favourite? Painting is the medium I am most comfortable and most familiar with. I love the infinite access to colour through paint and the flatness of the medium. What takeaway would you like your audience to have from your creations? It’s open to their interpretations. They will take what they need to from the work.